After December 10, Kingdom Books intends to only provide mysteries -- our Poetry Room is under contract to leave us, en masse. That means there are just about three weeks to browse and purchase from our poetry collection. Yes, I'll still offer poetry news and reviews. What can I say, life without poetry would be colorless for me! 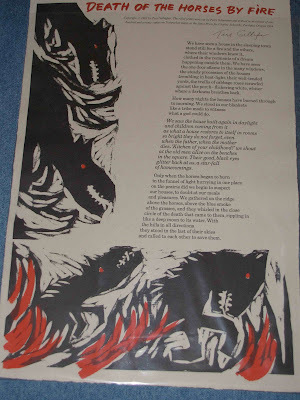 And who knows, a few current books of poems may slip into our listings from time to time. 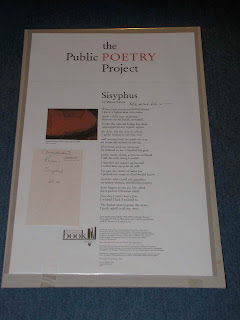 It's been great getting to know the poetry lovers who've enjoyed our collection of 2,400 books of contemporary poetry. Our thanks to you all. Vermont book artist Brian Cohen announces an exhibit of his etchings and watercolors -- if you're a fine press fan, this is worth a visit, for Cohen's illustrations often contribute significantly to the impact of the books he builds and offers through Bridge Press. The exhibit is at the Putney School Gallery, Michael S. Currier Center, Elm Lea Farm, Putney, Vermont, Dec. 4, 2009, through Feb. 20, 2010. An opening reception will be held on Friday, December 4 from 7 to 9 p.m. For map and directions, click here. Here at Kingdom Books, when we introduce a series to someone who hasn't read any of the books by that author before, the first question we hear is, "Do I need to read the books in order?" And if the answer is "no," then the question is either, "What is this author's best?" or "Which one will take me into the series best?" A couple of days ago, I provided a talk on the Nancy Drew books for a local college women's group. Reviewing the history of that famous series, I found that the contract for writers of the books had given an explicit instruction to mention other "cases" that Nancy had solved -- obviously, to encourage readers to purchase more of the 56 (!) books that eventually went into print for the original group. But Barr's BORDERLINE, even though its most acute stresses rest on the damage Anna Pigeon took during the events on Isle Royale in the preceding book WINTER STUDY, is easily a read-it-on-its-own book. Barr's smooth presentation of Anna and her inner conflicts is effective and concise. Reading or re-reading WINTER STUDY just before picking up BORDERLINE won't change the crucial understandings of the plot or of the shifts in Anna's grasp of her world. Absolutely the opposite holds for Louise Penny's Chief Inspector Gamache novels. Set in the Eastern Townships of Quebec, caught in the conflict of French and English heritage and language, and focused initially on a Brigadoon-like village called Three Pines -- it's so out of the way that you only seem to find it, and its endemic peace, when you need it -- the series has already produced an Agatha Award and a New York Times bestseller for Penny, who is a former Canadian broadcasting (CBC) radio journalist. And the Inspector Gamache books build quietly, one on top of the next, toward an exploration of evil and its effects that can only be noticed, comprehended, and appreciated if you read the books in order. Start with the relatively slow STILL LIFE, which initially appears to be a village "cozy" detective tale; A FATAL GRACE proves that behind the politics of Gamache's superintendent is a lurking menace that threatens to unravel his best work and, in THE CRUELEST MONTH, will attack and damage his family as well. Then Penny enters further darkness of place and soul in her fourth book, A RULE AGAINST MURDER, so that number five, THE BRUTAL TELLING, can prove once and for all that her village setting has nothing to do with coziness, and everything to do with threat and anguish. All of this thought brings me to Michelle Gagnon's FBI series, built around Special Agent Kelly Jones, a young woman who has climbed rapidly within the agency because she tackles violent crime with fierce determination. Gagnon positions Jones with two enduring personal crises that affect her investigative capacity: First and foremost, shadows from her childhood both fuel her determination and damage her sense of self. And second, as a vibrant young woman, she's vulnerable to the persistent courtship provided by Jake Riley -- and Riley, in ways that are frustrating and dangerous, can access the FBI's "old boy" network in ways that Jones, as a female, may never be allowed to do. At the same time, Riley's been independent for so long that he rocks each boat politically, while sometimes anchoring, sometimes storming Kelly Jones's life. Gagnon is a California author with powerful links into the networks of suspense writing. Her debut in THE TUNNELS was greeted warmly by other authors, and I've recommended the book as one of those "paperback originals" that turn out to be a must for a serious collector in the field -- ignore the fact that the publisher is the relatively soft publishing house MIRA. (In fact, if MIRA keeps choosing authors like Gagnon, it will earn a very different reputation. You go, MIRA!) The violent criminal in THE TUNNELS quickly makes his attacks on female college students into a personal attack on Jones. And as the madness of the attacks escalates, a similar disturbing madness creeps out of the depths of Jones's past. THE BONEYARD drew Kelly into political tangles that complicated and threatened her capacity to prevent serial killings and hostage taking. Written with expert pace and polish, it moved Gagnon onto my personal list of "this author is going to be a must-read from now on." Could you read it without having read THE TUNNELS and still get as much from it? Probably -- at least that was what I figured. 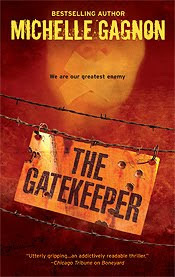 But now Gagnon's third Kelly Jones is available (came out a couple of weeks ago), THE GATEKEEPER. The cover blurb from bestselling suspense author Lee Child reveals that Gagnon's effort to write as powerfully as the top thriller authors has been highly effective. (She also earns review praise from Douglas Preston and Jeffrey Deaver -- see her web site, www.MichelleGagnon.com.) While she's honed her writing, she's also earned membership in Sisters in Crime, Mystery Writers of America, Romance (!) Writers of America, and International Thriller Writers, and is a weekly contributor (usually on Thursdays) to the hot suspense writing blog The Kill Zone. In other words, as Kelly Jones fights for her successful career as a Special Agent, Gagnon's working just as hard and effectively in the suspense authors field. When THE GATEKEEPER opens, a nasty kidnap-and-ransom case lands with an unpleasant splat on the desk of Jones's fiancé, Jake Riley. Jake's new investigative office, The Longhorn Group, is primed for this moment -- so with a wince of pain for the victim and her family, but also an undisguised eagerness, Jake plunges into action. He hopes that he may be able to lure Kelly into his operations eventually, if she finds the FBI as ultimately fettering and unsatisfactory as he already has. Meanwhile, he has a former CIA operative as business and investigative partner, and life looks good. Special Agent Kelly Jones, at the same moment, is already caught in what may be a typical FBI web of government intrigue and misinformation, spun around the gruesome murder and dismemberment of a U.S. senator. Think Arizona, immigration reform, right wing versus left. Add skinheads, border militias, even bikers -- could something, or someone, be drawing the hate groups toward a common goal? (p. 184) Kelly clicked the phone shut, exasperated. She was still trying to process everything Jake had said, something about a kidnapped girl, a mothball fleet and a dead kidnapper. Then the offhand remark that she might have to post bail if things didn't go well. Not exactly a stellar beginnning for The Longhorn Group, she couldn't help thinking. She knew Jake well enough to assume he was glossing over details that might upset her. It was one of the things that gave her pause this ability to play things fast and loose when it suited him. (p. 242, Jake's point of view) On the way back he reveiwed his last conversation with Kelly, and the reprobation in her voice. He knew they had different philosophies about how to work a case, and that if she joined The Longhorn Group that might become an issue. It could even end up widening the schism between them. But what was the alternative? So, as for Louise Penny's series, reading Michelle Gagnon's suspense in sequence gives a richer, darker take on what's unfolding in this third volume. Unlike Penny's sequence, Gagnon's books are moving toward a more personal rather than political disaster. But the sense of being forced by one's past, and of struggling for courage and companionship in a career that force-feeds despair and depression to its most successful operatives, is fully present. Thanks, Michelle Gagnon, for constructing this series and its compelling investigators. Not only do we now have three increasingly exciting books to enjoy -- but you've created a hunger for the next one. I'll be waiting. NOT patiently. Announced this evening, the National Book Award in Poetry has gone to Keith Waldrop for his book TRANSCENDENTAL STUDIES: A TRILOGY. See the NBA citation page for more information. Congratulations to Keith. 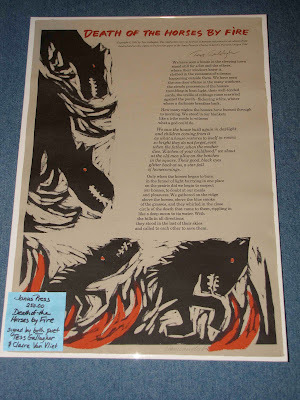 We're adding some of our poetry broadsides to our listings on ABE Books (go to www.KingdomBks.com and click on Browse & Buy, then use keyword Broadside). Here are photos of four of my favorites. Details on ABE, or drop us an e-mail (KingdomBks@aol.com). Consider yourself invited to two poetry events happening in November and December! I'll be reading at the Toadstool in Peterborough on November 14, and giving a short short reading & mingling over refreshments and books with several other poets at Gibson's Bookstore in Concord in December. It would be great to see you! Details below and attached. Saturday, November 14, 11 a.m.
Thursday, December 10, 7 p.m.
Maxine Kumin's poetry reading at St. Johnsbury (VT) Academy on Friday Nov. 6 has been canceled to the flu pandemic, which has closed the school campus. We hope to reschedule. Stay healthy! We're passing this along for Pine Manor College, www.pmc.edu/mfa for more details. Nice way to leap into the new year! Pine Manor College is pleased to announce that a select number of graduate-level creative writing courses will be open to the public for auditing during the January Residency of its Solstice MFA Program, scheduled from January 1–10, 2010. Narrative Arrival: A Craft Class for All Genres A course on film adaptations of the novel: Is the Book Always Better? Thursday, Nov. 5th, 2009 at 7:30 pm, poets Pamela (Jody) Stewart, Peter Waldor and April Ossman will read from their work. Free. Mocha Maya's Coffee House, 47 Bridge Street, Shelburne Falls, MA 01370, 413-625-6292. Wheelchair accessible. See www.collectedpoets.com for more information. Pamela (Jody) Stewart was born in Boston. She received her BA from Goddard College ADP and her MFA from the University of Iowa. Among her publications are four poetry chapbooks and five full-length volumes of poems: The St. Vlas Elegies (L'Epervier Press, l977), Cascades (L'Epervier Press, l979), Nightblind (Ion Books/Raccoon, l985), Infrequent Mysteries (Alice James Book, l991) and The Red Window (University of Georgia Press, l997). A chapbook, The Ghost Farm will be published by Pleasure Boat Studio in the spring of 2010. Jody has been included in the Pushcart Anthologies twice, won American Poetry Review's first prize for Best Poems of l980, and received a Guggenheim Fellowship, a Hawthorndon Fellowship and an MCC grant. She met her current husband Ed Cothey while traveling in Cornwall, UK. They returned to the States in l990 to Hawley, MA and formed Tregellys Farm. Jody is working on a New and Selected volume. Peter Waldor was born in Newark, New Jersey. He is a graduate of the Iowa Writers' Workshop. For the past twenty years Waldor worked in the insurance business in northern New Jersey where he lives with his wife and three children. 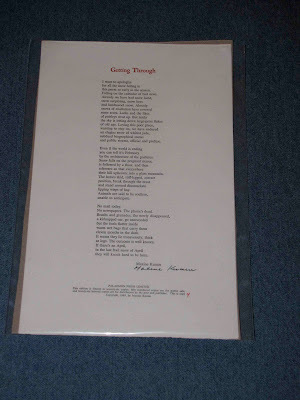 Waldor's poetry has appeared in many magazines (both in print and on-line)such as Poetry Daily, Verse Daily, theAmerican Poetry Review, Ploughshares, the Iowa Review and Mothering Magazine.Waldor's book of poetry, Door to a Noisy Room, was published by Alice James Books in January, 2008. April Ossmann is the author of Anxious Music (Four Way Books, 2007) and has published her poetry widely in journals including Colorado Review, The Spoon River Poetry Review, and Harvard Review, and in anthologies including From the Fishouse (Persea Books, 2009) and Contemporary Poetry of New England(UPNE, 2002). She has won several poetry awards, including the 2000 Prairie Schooner Readers' Choice Award. She is a publishing, writing and editing consultant (www.aprilossmann.com), and teaches poetry in private tutorials and at The Writer's Center in White River Junction, VT. She has also taught at Lebanon College and the University of Maine at Farmington and was executive director of Alice James Books from 2000 -2008. She lives in Post Mills, VT.
As generations, we may sometimes be defined by the wars or acts of war that have shaped our thinking. Many of my friends shaped their ideas of life by testing them during the Vietnam War: Is government trustworthy? Are political leaders honest? How responsible does a reader have to be in testing what's in print? My son's generation, I suspect, is scarred in the same way by the 9/11 Attack Against America -- and the political and cultural responses to America's newly perceived vulnerability. But these are very much American experiences, American ideas. I don't expect to "see Europe" as my father's generation did, or to explore Asia as my sons do and will. So the mysteries that I read often shape my thinking about those regions and their histories, cultures, and people. My sense of England's recent heritage (forget Robin Hood and Shakespeare) draws in part from the Great War mysteries of Charles Todd and Jacqueline Winspear, not to mention John Lawton and Christopher Fowler for the grimmer side of things. I always order the newest Donna Leon to sample Venice, and Giles Blunt for northern Canada. I have enough good sense to doubt that Alexander McCall Smith's No. 1 Ladies' Detective Agency is more valid than, say, Peter Mathiessen's African travelogues -- but I still enjoy the notion of common people solving human dilemmas through common sense. And I won't even try to talk about the sustained darkness of the current crop of Scandinavian detectives and tales, from Henning Mankell, Karin Fossum, and others. Way beyond these explorations, though, is the complex and often grim history of Eastern Europe, a region that must have been fiercely present to my father's generation (those who saw World War II firsthand) but has quietly vanished along with the Cold War for today's Americans. Most of the people I know personally who talk about Slovenia or Hungary are tourists, happy to spend American dollars where they seem to buy more. Alan Furst's review of Kati Marton's ENEMIES OF THE PEOPLE in today's New York Times begins, "The year is 1955; most of the world has taken sides in the cold war." Marton's book explores her parents' desperate lives in Cold War Hungary and "has all the magnetism and, yes, excitement, of the very best spy fiction. But would that it were fiction." Furst writes this from his position as author of ten fierce and wonderful books of "spy fiction" set in Eastern Europe, most recently THE SPIES OF WARSAW, which went into paperback in June of this year. Like the memoirist, he's lived in the countries where he sets his fiction, although not for long periods of time (Paris is his outside-America home). And he writes from having known the people and cultures that were once behind the Iron Curtain, where the machinations of the Communist Party bred a desperate corruption necessary to sustain life. It's uncomfortable reading. Although I'm often moved and always, in the end, deeply satisfied with Furst's plots and characters and their efforts to trade what they can afford to lose, for the integrity they desire, these are books that I face seriously. They're not beach reading. They demand that I question my own willingness to sacrifice for ideals like democracy and freedom of the press, as well as for the safety of my family. Forgive, please, this long approach -- but what the latest mysteries of Eastern Europe demand has slowed me down in reaching a review of Michael Genelin's first two books with Soho Crime: SIREN OF THE WATERS (2008) and DARK DREAMS (2009). Genelin introduces Commander Jana Matinova, an often lonely investigator on the police force in Slovakia. Estranged from her rebel husband (an outlaw for his political stance, at the very least) and from her daughter, she labors under conditions of post-communist mistrust, betrayal, and a coldness that is more than the subzero wind sweeping through her state-issue coat. Each advance in her cases comes at personal cost. In SIREN OF THE WATERS Matinova investigates human trafficking, a commerce of flesh and power that roots in the poverty left behind by uncaring governments. Fear, urgency, and a prevailing sense of being sold out dog her movements. It's hard to say whether she's most at risk from the criminals she chases or from her own colleagues in their equal desperation. How can we like this woman who lies when necessary, sacrifices her family, then abruptly gives up her self-respect in order to save others? The threads pulled loose from this weave of threat and determination become ragged edges about to unravel in Genelin's sequel, DARK DREAMS. Martinova's career and family, even her life, balance on a knife edge. Her own childhood friend, Sofia, entangles her in bribery and corruption scandals; killings multiply. Soon even her colleagues mistrust her: "Everyone assiduously avoided mentioning Jana's involvement as a possible suspect. They went about their business and, when they had contact with Jana, avoided any topic other than the one at hand. Things were stiff and overly polite, but it could have been much worse. ... Jana used the time to go over her notes." As crime fiction goes, these stand toward the dark side, not so much for brutality or gore as for the certainty that "home" is a place of danger and loss. But they are utterly convincing, and I wouldn't miss them for anything. If we are to understand the force of history and the passions of the present in Eastern Europe, Genelin, like Furst, is a valuable guide. And Jana Matinova's courage, and her willingness to keep trying for justice, generate a heat and light worth valuing.